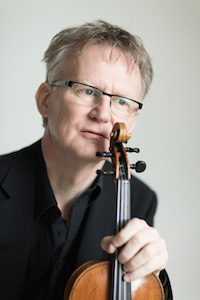 Thomas Bowes is widely recognised as one of the UK’s most versatile and accomplished violinists – as a soloist, chamber musician, concertmaster and artistic director. His concerto work in the UK, Germany and the USA has included performances of the Elgar, Walton, Britten and Szymanowski concerti. At the invitation of Lady Walton, Tom spent three weeks on the Island of Ischia – Walton’s long time home - studying the history and score of the Walton concerto. His subsequent critically acclaimed recording of the work (along with the Barber concerto) for Signum Classics reveals a special connection to Walton’s music. Tom undertook an extensive ‘Bach Pilgrimage’ at the end of the 2012/13 season, giving fifty concerts of the unaccompanied Sonatas and Partitas of JS Bach in churches across mainland Britain and raising over £20,000 for various charities. He is currently in the process of recording the works for release in Spring 2018 and also planning further ‘Pilgrimages’ in the UK, Europe, USA and beyond. As an enthusiastic champion of contemporary music, Tom gave the world premiere of Eleanor Alberga’s Violin Concerto with the Scottish Chamber Orchestra conducted by Joseph Swensen. A second concerto by Alberga is planned for the 2017/18 season. Chamber music has been at the heart of Tom’s artistic life – he was the founding leader of the Maggini Quartet – and between 2003 and 2015 was the Artistic Director of the Langvad Chamber Music Jamboree in northern Denmark. More recently, with Eleanor Alberga, he founded the music festival Arcadia in north Herefordshire. Central to the ethos of both festivals is to bring fresh, authentic and vibrant music making to local communities and their audiences. Equally at home in the commercial recording studio, Tom is in great demand as soloist and concertmaster and works closely with many of today’s most eminent film composers. Among over 150 film credits are such hit-movies as “Skyfall”, “The King’s Speech” and “The Da Vinci Code”. Tom is privileged to own and play a violin by one of the great Cremonese makers - a splendid 1659 Nicolo Amati.